The Italian Embassy in Libya has given highly equipped ambulances to cities and towns in several areas of the conflict-wracked country, it was announced on Monday. The ambulances will go into service in the northwest town of Garabulli, Al-Zawiya, Sabha and Ubari in southwestern Libya, as well as the southeast city of Kufra and to the Children’s Hospital in the capital, Tripoli, according to a Facebook post by the Local Government Ministry. 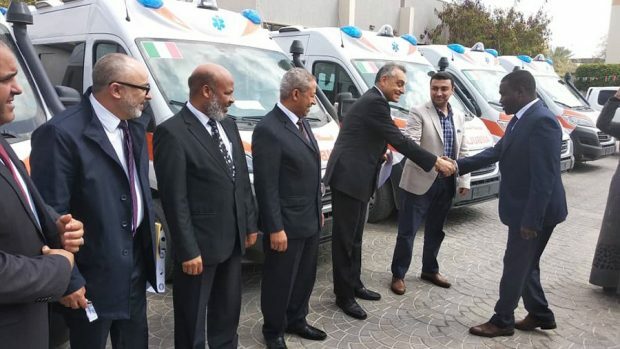 Italy’s Ambassador to Libya, Giuseppe Buccino, Libya’s Health Minister Hamidd Bin Omar and Local Government Minister Milad Al-Taher attended a ceremony to mark the handover of the ambulances.